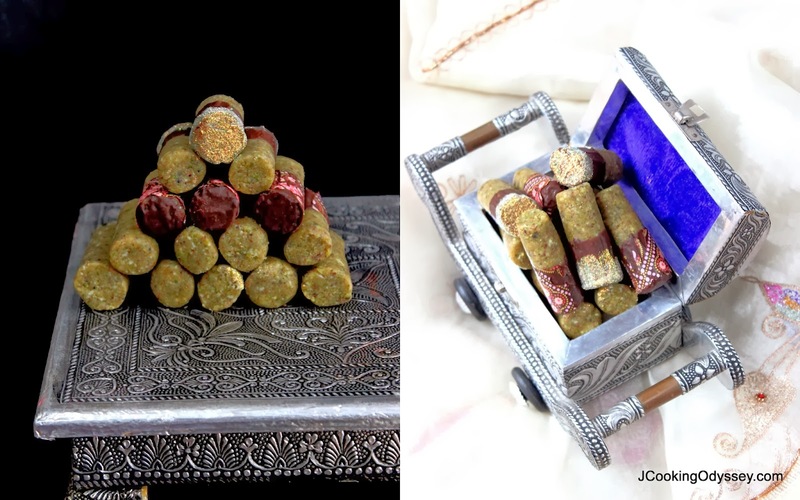 Jagruti's Cooking Odyssey: Ending 2013 on a sweet note with Pista Paneer Rolls - Pistachio Indian Cottage Cheese Rolls ! 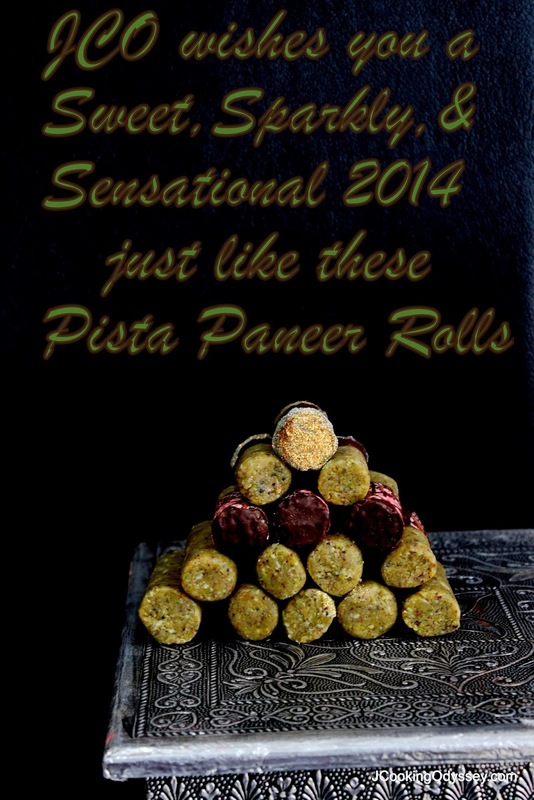 Ending 2013 on a sweet note with Pista Paneer Rolls - Pistachio Indian Cottage Cheese Rolls ! Didn’t the last twelve months fly by? In a blur of cooking galore, 2013 is almost over. It’s not all bad news, though. 2014 is just around the corner, and from where we’re standing, it looks like a lot of fun and feastful of joy ! 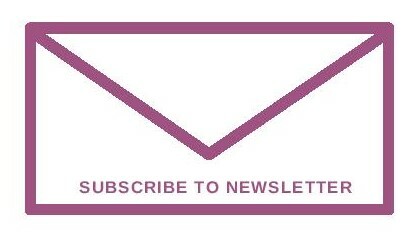 JCO wishes you and your family Happiness, Prosperity, Longevity, and Good Health ! What better way to bring in the new year than to sweeten your mouth! These lovely rolls are perfect to share with friends and family on NYE and New Years day! 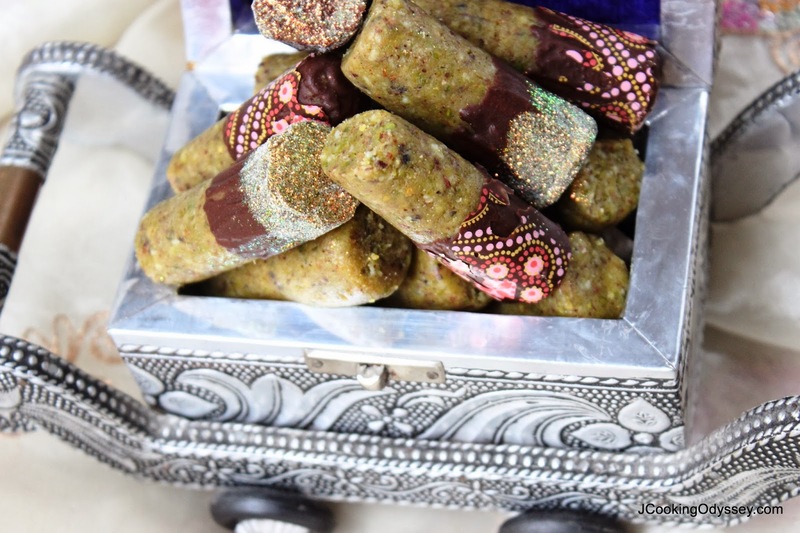 Pistachio Paneer rolls are delicate, rich and elegant. They surrender into your mouth, as their smooth, cardamom touched sweetness fills your taste buds. The pistachio pieces add a hint of flavour, but mostly provide a bite once the rolls have dissolved. Roast the pistachio nuts on a very low heat for 4-5 minutes in a heavy based pan. Let it cool completely. Grind them in the grinder till you get fine but not very fine powder. ( I like some crunch in the rolls ), leave it aside. Put the cream in a saucepan and bring to the boil, lowering the heat when it gets hot. Add the sugar and cook on a low heat until it bubbles and forms a single thread consistency - this should take 8-10 minutes. Meanwhile roast the khoya in a 1tbsp ghee for 2-3 minutes, take care not to burn the khoya. Add the khoya and stir for a couple of minutes until it begins to leave the side of the pan. Add the pistachio, paneer, cardamom and nutmeg powder and cook for a couple of minutes. You will get nice thick mass, if you want to make barfee, turn out onto a greased plate and allow to cool. Cut into squares. To make rolls transfer the mixture into another plate, let it cool slightly or till you can handle the mixture. Take work board grease your palm with little ghee and divide the mixture into 3-4 equal parts. Knead the mixture then shape it into long sausage. Kneaded up to your requirement whether you prefer thick or thin. Cover the sausages with the cling film not to wrap up tight, and leave it in the fridge for couple of hours. Take them out and cut the rolls into 3" pieces. 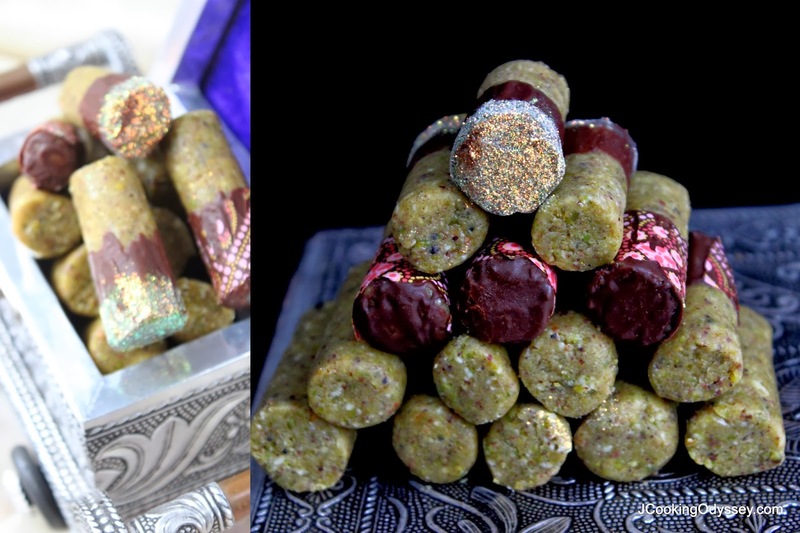 If you prefer roll them into silver edible foil ( varakh ) ( I don't use varakh as it is not suitable for vegetarians ) so I use edible glitter. These Pista Paneer Rolls are sweet and sumptuous. Great for any celebrations. Roast the pistachio nuts on a very low heat for 4-5 minutes in a heavy based pan. Let it cool completely. Grind them in the grinder till you get fine but not very fine powder. ( I like some crunch in the rolls ), leave it aside.Put the cream in a saucepan and bring to the boil, lowering the heat when it gets hot. Add the sugar and cook on a low heat until it bubbles and forms a single thread consistency - this should take 8-10 minutes. Meanwhile roast the khoya in a 1tbsp ghee for 2-3 minutes, take care not to burn the khoya. Add the khoya and stir for a couple of minutes until it begins to leave the side of the pan.Add the pistachio, paneer, cardamom and nutmeg powder and cook for a couple of minutes. You will get nice thick mass, if you want to make barfee, turn out onto a greased plate and allow to cool. Cut into squares.o make rolls transfer the mixture into another plate, let it cool slightly or till you can handle the mixture. Take work board grease your palm with little ghee and divide the mixture into 3-4 equal parts.Knead the mixture then shape it into long sausage. Kneaded up to your requirement whether you prefer thick or thin. Cover the sausages with the cling film not to wrap up tight, and leave it in the fridge for couple of hours. Take them out and cut the rolls into 3" pieces.If you prefer roll them into silver edible foil ( varakh ) ( I don't use varakh as it is not suitable for vegetarians ) so I use edible glitter.I had some melted chocolate left from wheat germ & Mocha Cream Cookies, so I dipped in the melted chocolate and applied chocolate transfer sheet. These look so professional and tempting.. Happy New Year! why varakh is not suitable for veg.? Do you get edible foil in uk? Lovely post for 2014! They are made by hammering thin sheets of silver in middle of booklets made of a bull's intestines. In other words, after slaughtering a bull, quickly his intestines are removed, and sold to the manufacturers of foils. The skins made of old intestines are of no use. Even one-day-old intestines can not be used, because within a few hours they stiffen. These Pista Paneer rolls look so delicious! I've never heard of them but I want to try these rolls real soon. All of the spices in these sound amazing. 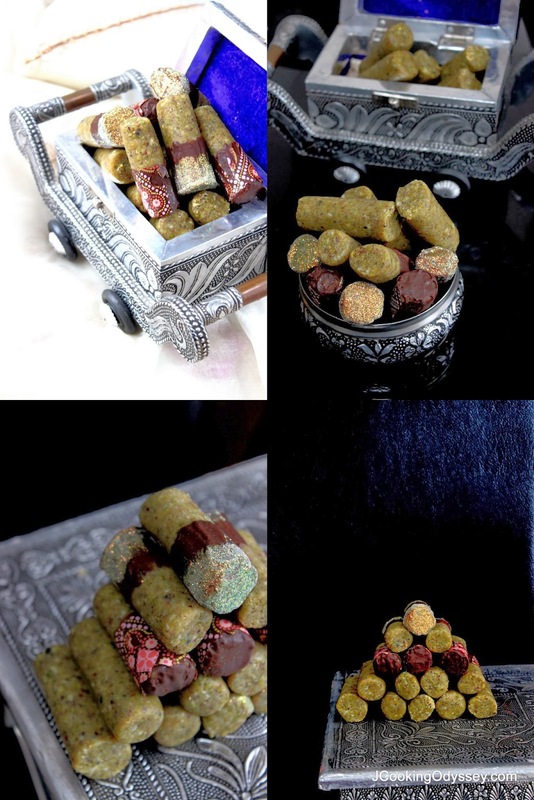 I love cardamom and nutmeg and anything with pistachios! This looks so good. I love pistachios!!! These are such a beautiful treat! 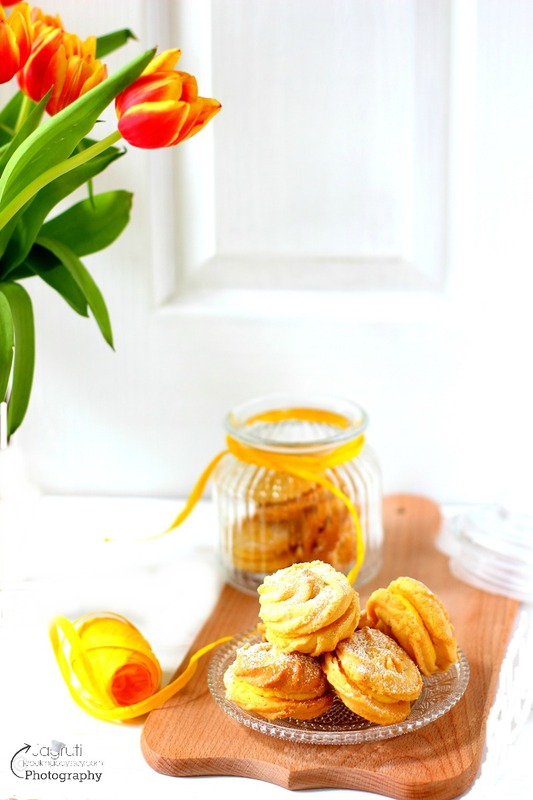 These treats look amazing.Perfect for the upcoming festive season. These look so tempting and inviting!! Perfect for upcoming festive season! I love pistachio. I will try this recipe soon. Looks awesome. The flavors here sound great to me, especially the pistachios! Never tried this Pistachio paneer roll and this one looks interesting. Yum! I have only tried paneer in savory dishes so far. These rolls look absolutely incredible. I love all of those spices. This sounds delicious, I love anything with pistachios!